Maybe your mind sometimes is preoccupied with different kinds of troubles in your digital life. For instance, you just have downloaded your favorite online videos and are very eager to make them play on some portable player like DVD. In fact, it is a little inconvenient for you to burn online video to DVD easily. You might need some applications to accomplish the task. And you could find the solution in the article below. You would only use two simple programs to complete the whole task easily. Just go on reading the whole text easily and benefit a lot from the article freely. Have you ever met such problem? In fact, there are lots of similar issues about how to burn HD video onto DVD. As the HD’s increasing popularity, people are more and more the pursuit of the video with high definition. However, there are still many people get in trouble when try to burn HD video to DVD. Here I would like to share an effective solution on how to convert HD videos to DVD with full quality. Leawo YouTube Downloader has been widely recognized as the best program to download YouTube videos, and other online videos from different kinds of video sharing websites like Facebook, MySpace and many more. What’s more notable is that the useful software could even provide multiple and flexible download options at different resolutions. Additionally, Leawo Video Downloader could offer you the powerful ability to manage and customize the downloaded videos easily. What this means in practice is that you’re able to arrange them by name, time, size or length. Here we would like to introduce the detailed description of each of the steps on how to download online videos with the powerful Leawo Video Downloader. You may need to go to the official website and click the “Download” button to start the downloading process and then open the program freely. Or you can directly click the download buttons below. Here you could click the “Download” button on the top menu, copy and paste the online video URL in the address box easily. In the other case, you could directly make good use of the IE browser to browse your desired online videos for further downloading. The step is specially designed for you to go to the wait-to-select panel by clicking the little green arrow. After that you could be able to select one of them and click the “Download” button for further downloading. Keep in mind that you could be able to preview and play the online videos in the process of downloading. After several minutes of downloading you could locate the downloaded videos under “Downloaded” tab. Since that you’ve downloaded your desired online video, then you may need to burn online video to DVD easily with some kind of the powerful program such as Leawo DVD Creator. Now we would like to share you with some useful information on how to burn online videos to DVD. Leawo DVD Creator is such one useful software loaded with the ability to convert many kinds of video files from different sources to DVD with the easy-to-use interface. If you want to burn online videos to DVD by using Leawo DVD Creator, then you may need to download Leawo DVD Creator for free and open the program freely. Here you may need to read the instruction on how to burn online videos to DVD below for details on these steps. The easy to use program could offer several kinds of loading ways. 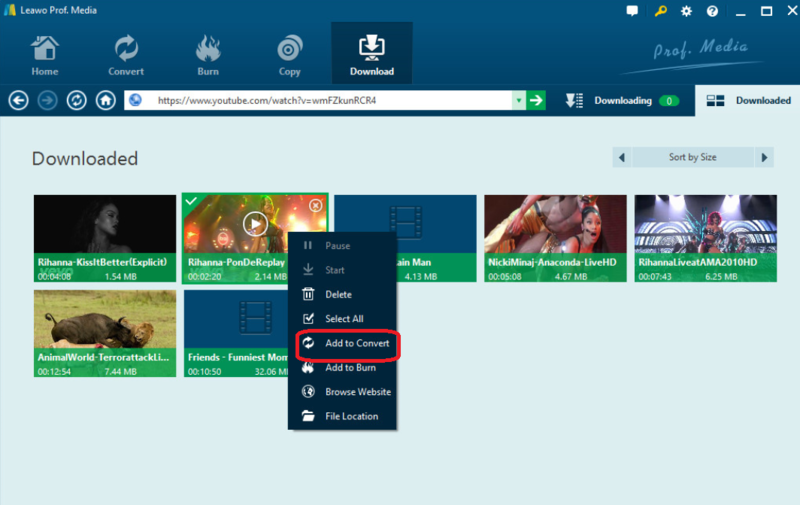 For example, you’re able to click the “Add Video” button to load the downloaded online videos to its interface, or directly drag and drop the online video files to the software. The program could offer you the ability to set the disc menu from the right sidebar to export the DVD movie. Here the disc menu templates in many different kinds of themes could be chosen as you desire. Now you could be able to click the big green “Burn” button in the upper left corner of the interface so as to activate the burning settings panel. 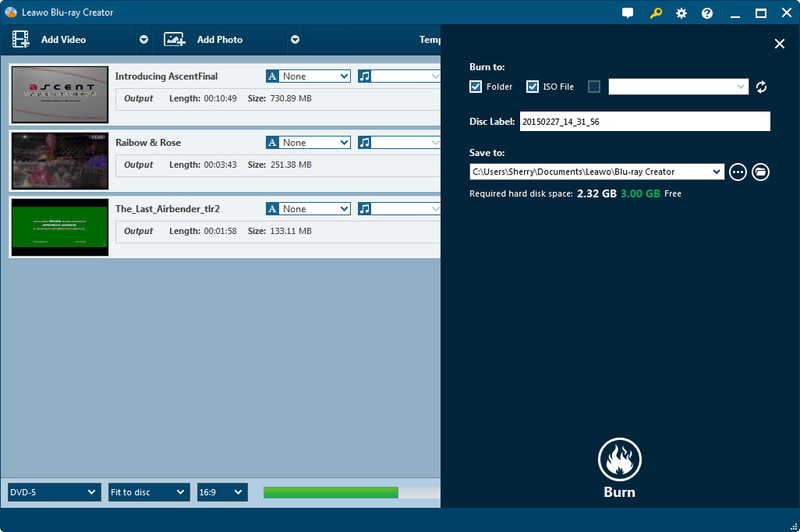 It’s the place where you’re able to customize the different kinds of options like Burn to, Disc Label, and Save to. The last yet also important step is to convert online video to DVD by clicking the “Burn” icon at the same burning settings panel. The whole burning process would only take several minutes. To conclude, Leawo DVD Creator could be your ideal option for you to burn videos from online source or some other popular sharing websites to DVD with the fastest burning speed in comparison with the products of the same kind. Apart from that, it could also offer the editing options in different ways. Even the new users could feel especially pleased with the software with the user-friendly interface. Therefore, even if there are lots of DVD Burners on the market, I think Leawo DVD Creator is always the best choice.